Are you looking forward to a new comic book but it’s impossible for you to wait for its release before you know what we thought about it? That’s why there’s DoomRocket’s Advanced Reviews — now we assess books you can’t even buy yet. 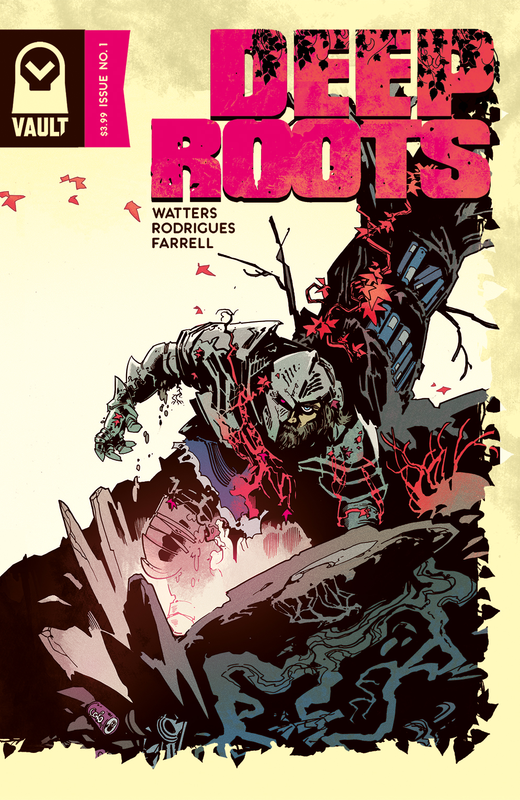 This week: ‘Deep Roots’ #1, out April 25 from Vault Comics. By Mickey Rivera. There’s a faintly sadistic undercurrent to Deep Roots #1. This horror fantasy from the creator of Limbo takes much of its inspiration from the forest. Aesthetically, the line work brings to mind the roughness of tree bark, the color conjures amber and every imaginable tone of wood. Narratively, writer Dan Watters works off of that one solid rule of the wilderness: it is brutally indifferent to your well being. A handful of interesting characters are introduced in this issue, but one in particular seems to be the linchpin: The Sentinel. This armored, longsword wielding warrior lives in a separate world from ours, a spiritual plane that was once home to creatures of myth and legend and is now slowly dying away. The Sentinel wanders this plane solemnly, discovering that his world is being killed off by our world, which is slowly leaking into it. The leak is two-ways. Trash, Costcos, and who knows what else has been popping up in the spiritual world, while back in our world smack-talking monsters made entirely of vegetable material have been robbing banks. There has also been a strange dream infecting the minds of humans, dreams of blood red roots and books filled with indecipherable knowledge written in the language of trees. Government agents, like the self described “very important person” Abigail Hester, have been scrambling to understand it all, searching for anyone up to the task of facing the threat head on. Watters’ writing style in Deep Roots is a blend of solemn mythologizing, existential irony, and snark. There is a sharp difference between the style and feel of scenes taking place on the spiritual plane versus those taking place in our world, not only in the writing but in the art style. Triona Farrell’s colors stay rooted in earth-tone gradients, but in the other world they break out into rivers that flow wonderfully beneath Val Rodriguez’s intricate drawings. Both artists have a knack for conjuring dirt and grime, with organically diffuse line work and Van Gogh style coloring that gives splash pages and key panels this fantastic internal motion. Hints of the deeper world Watters is building are tantalizingly strewn throughout the book. One running theme is dendrochronology, or the use of a tree’s growth rings to deduce information about its surroundings. Growth rings figure into the opening lines, and appear inside the mysterious books people have been dreaming of. By this logic, an old enough tree would be able to tell the history of the world in its rings. It will be interesting to see what terrifying ancient story these books are trying to tell, and how it fits into the Sentinel’s purpose. For those who take their fantasy comics with a heavy dose of horror and intricate artwork, Deep Roots will be a good read. There definitely something strange and alive lurking in its future. 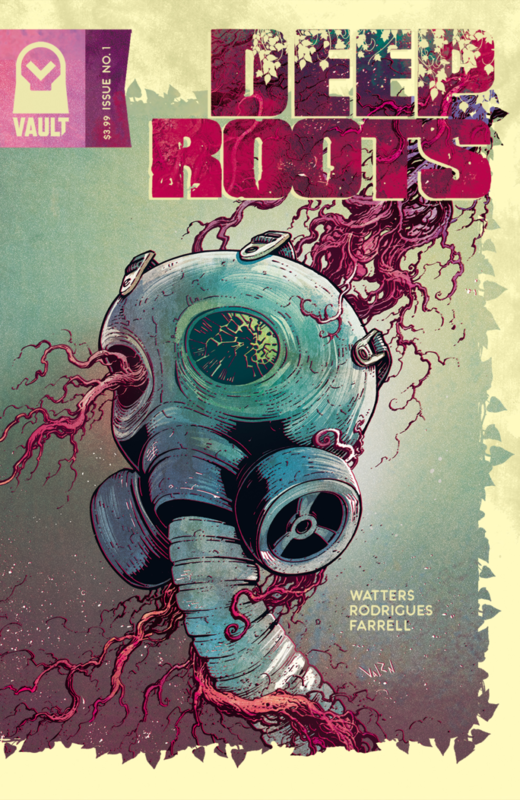 ‘Deep Roots’ #1 hits stores April 25.